Cupcakes! Just about everybody likes them. I definitely do. 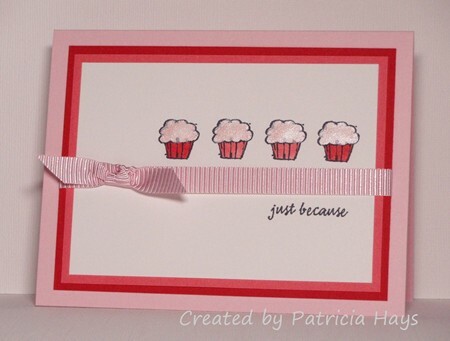 😳 Cupcakes are this week’s Clean and Simple Challenge theme at Splitcoaststampers. I’ve been trying to complete some of the Hope You Can Cling To challenges, too. My friend Lee is hosting an inspiration challenge with a photo of some, shall we say, very embellished cupcakes. Remember how last week I said that photo inspiration challenges tend to stump me? I’d been having a really hard time figuring out what to do for Lee’s challenge when I finally decided to use the colors from the photo for my cupcake-themed CAS card. And then it all came together pretty easily – except for one glitch. I pulled out my Shimmerz paints to color the icing on the cupcakes, and when I opened the jar, I found a shimmery substance about the consistency of toothpaste. UH OH. But thanks to my friend Sheila and a quick search at SCS, I learned I could add a little water to the paint to thin it. That worked! If you haven’t yet joined in on the CAS or the HYCCT challenges, I hope you’ll jump in and share your creations! Love this card Patricia! The colors are so bright and cheery and the cupcakes are just adorable.